The DPF9300 digital input panel meter offers many features and performance capabilities to suit a wide range of industrial applications. The DPF9300 offers both counting and rate in the same package. The optional plug-in output cards allow the opportunity to configure the meter for present applications, while providing easy upgrades for future needs. The meters employ a bright 14 mm (0.56") LED display. The intensity of the red LED display can be adjusted from dark room applications up to sunlight readable, making it ideal for viewing in bright light or dark room applications. The meters accept digital inputs from a variety of sources including switch contacts, outputs from CMOS or TTL circuits, magnetic pickups and all standard RLC sensors. The meter can accept directional, unidirectional or quadrature signals simultaneously. The maximum input signal varies up to 34 KHz depending on the count mode and function configurations programmed. Each input signal can be independently scaled to various process values. 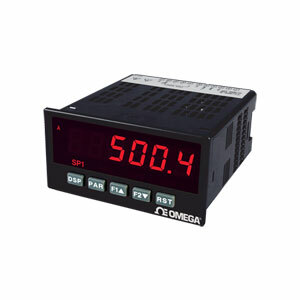 The rate meters provide a MAX and MIN reading memory with programmable capture time. The capture time is used to prevent detection of false max or min readings which may occur during start-up or unusual process events. The meters have four set point outputs, implemented on plug-in option cards. The plug-in cards provide dual FORM-C relays (5A), quad FORM-A (3A), or either quad sinking or quad sourcing open collector logic outputs. The setpoint alarms can be configured to suit a variety of control and alarm requirements. Communication and Bus capabilities are also available as option card through the bus. Additionally, the meters have a feature that allows a remote computer to directly control the outputs of the meter. With an RS232 or RS485 card installed, it is possible to configure the meter using free software. The configuration data can be saved to a file for later recall. A linear DC output signal is available as a plug in option card. The card provides either 20 mA or 10V signals. The output can be scaled independent of the input range and can track any of the counter or rate displays. Once the meters have been initially configured, the parameter list may be locked out from further modification in its entirety or only the set point values can be made accessible. The meters have been specifically designed for harsh industrial environments. With NEMA 4X (IP65) sealed bezel and extensive testing of noise effects to CE requirements, the meter provides a tough yet reliable application solution. Memory: Nonvolatile E2PROM retains all programmable parameters and display values. Construction: This unit is rated for NEMA 4X/IP65 outdoor use. IP20 Touch safe. Installation Category II, Pollution Degree 2. One piece bezel/case. Flame resistant. Synthetic rubber keypad. Panel gasket and mounting clip included. INPUTS A or B: DIP switch selectable to accept pulses from a variety of sources including switch contacts, TTL outputs, magnetic pickups and all standard RLC sensors. Logic: Input trigger levels VIL=1.5V max; VIH=3.75V min. Current Sinking: Internal 7.8 KΩ pull-up to +12 Vdc, IMAX=1.9 mA. Current Sourcing: Internal 3.9 KΩ pull-down, 7.3 mA max @ 28 Vdc, VMAX=30 Vdc. Filter: Damping capacitor provided for switch contact bounce. Limits input frequency to 50 Hz and input pulse widths to 10 msec. minimum. DUAL COUNT MODES When any dual count mode is used, then User Inputs 1 and/or 2 will accept the second signal of each signal pair. The user inputs do not have the Logic/Mag, High/Low Freq, and Sink/Source input setup switches. The user inputs are inherently a logic input with no low frequency filtering. Any mechanical contacts used for these inputs in a dual count mode must be debounced externally. The user input may only be selected for sink/source by the User Jumper placement. 참고: *Software is free at our download page. Comes with complete operator's manual.